As logical White men and women, Creators one and all, we do not accept belief in mysterious, magical beings living in the sky, controlling our lives, and as such we do not approve of religions based on the primitive fantasies of the delusional. Therefore, as Pontifex Maximus in this, the third era of Creativity, I believe it is my duty to declare all so-called religions based on fantasy to be null and void. Amongst other religions, this includes that tripartite scourge on our White racial brethren across this wide blue planet of ours: Judaism, Christianity and Islam. Hal Turner is, or rather, was a right-wing, US internet radio, talk-show host and blogger. Racialists around the world adore him to such an extent, they practically idolise Turner, hanging on for his every word as if he is their saviour and sending him cash at every request. Having no interest in US domestic politics or use for the rhetoric of right-wing, nationalistic Christians, I never bothered to listen to any of Turner’s programs, so I can’t say whether his supporters were on the ball or just looking to follow anyone with a loud mouth. WHITE supremacy is so yesterday, don’t you think? But the skinheads are using a modern medium for their oh-so-1950s messages. And, as with so much online, it’s a rare chance to see inside a different world. A strangely amusing world. VICIOUS attacks against Indian students have prompted the Rudd Government to consider a legal crackdown on hate-mongers. Investigations have started into creating a specific offence of inciting violence against an individual on the basis of race. While state assault laws already deal with thugs who personally commit attacks, the potential federal changes would focus, for example, on those responsible for sending SMS messages that urge acts of violence on individuals. Is it pride or prejudice? THE symbol of Australian pride is being hijacked by a new breed of hooligans who drape themselves in the national flag before embarking on hate-filled rampages. Urban studies expert Professor Kevin Dunn believes there is no question some young people who opted for tattoos had done so to advance their own racist agendas. So, You’re a Political Activist Now? Don’t think that your single interview in a local paper makes you the king of activists. 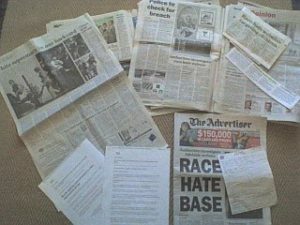 Some of my own efforts are: ABC Radio; The Australian, Adelaide Advertiser, Sydney Morning Herald, Hobart Mercury, New Zealand, Malaysia, Indonesia, India, Al Jazeera, Israel, UK, and US/Illinois papers – and I wouldn’t call that much effort at all. Police shot and killed a 15 year old boy carrying knives at a Northcoate Skate Park in Melbourne on Thursday night. Initial reports were sketchy, but according to the MSN (Mainstream Media), police had attempted to subdue 15 year old Tyler Cassidy with capsicum spray, and then pursued him to the Skate Park where four officers cornered the boy and from 10 to 15 metres away fired six shots into his chest, killing him. As could be predicted, there was an immediate outcry in the MSN (Mainstream Media) about trigger happy, heavy handed police brutality. DISCRIMINATION against dominant white males will soon be encouraged in a bid to boost the status of women, the disabled and cultural and religious minorities. Such positive discrimination — treating people differently in order to obtain equality for marginalised groups – is set to be legalised under planned changes to the Equal Opportunity Act foreshadowed last week by state Attorney-General Rob Hulls. A COUNCIL has ordered an ex-soldier to take down the Australian flag which flies outside his house because it has been deemed “offensive” by a neighbour. Aaron Wilson erected the 5m high flagpole eight weeks ago, in honour of his friends who served in Iraq. But on Tuesday, Logan City Council called to tell him a neighbour had made a complaint, labelling it “offensive”. He was told to remove the pole or risk legal action. Mr Wilson, whose father fought in Vietnam, said he was disgusted.